Amazing opportunity to own this fabulous 3 bed, Pool Home located on scenic pond in Westchase "Bridges" subdivision, close to Westchase Village shops and restaurants. New Roof in 2016. Brick paver driveway and walkway leads to double front doors with beveled leaded glass into the 2 story foyer with dramatic stairway in the spacious open concept living & dining room combination with plantation shutters on all windows. The kitchen with new stainless steel gas range and refrigerator has windows allowing in plenty of natural light as well as the view of the pool and pond. The kitchen with breakfast nook has bay windows, next to family room. There are tinted sliding doors opening to an outdoor oasis, screened lania and salt water pool (new pump 2018). Relax under the retractable awnings and enjoy the view! Upstairs you will find a loft currently used as a home office, a spacious master suite overlooking the pond and pool with built in shelves. The master bath has dual bowl sinks, garden tub and frameless oversized shower and large walk-in closet. There are two more bedrooms and a secondary bath with dual sinks and tub/shower combination. There is a half bath downstairs, under staircase with designer bowl sink and lights. The location could not be better. You can easily walk to the town center restaurants and shops. The Westchase community has community pools, parks,tennis courts and golf course plus "A" rated schools. Lot Size: 0.25 Acres / 10856 Sq. Ft. Directions:Take Linebaugh Ave. to Westchase, turn right at stoplight for Montique, then left on Bridgeton and immediate right on Lightner Bridge, follow to 10417 Lightner Bridge. Home will be on the left. SchoolsClick map icons below to view information for schools near 10417 Lightner Bridge Drive Tampa, FL 33626. MFRMLS data last updated at April 23, 2019 1:09:59 AM PST. Home for sale at 10417 Lightner Bridge Drive Tampa, FL 33626. Description: The home at 10417 Lightner Bridge Drive Tampa, FL 33626 with the MLS Number T3156021 is currently listed at $415,000 and has been on the Tampa market for 73 days. 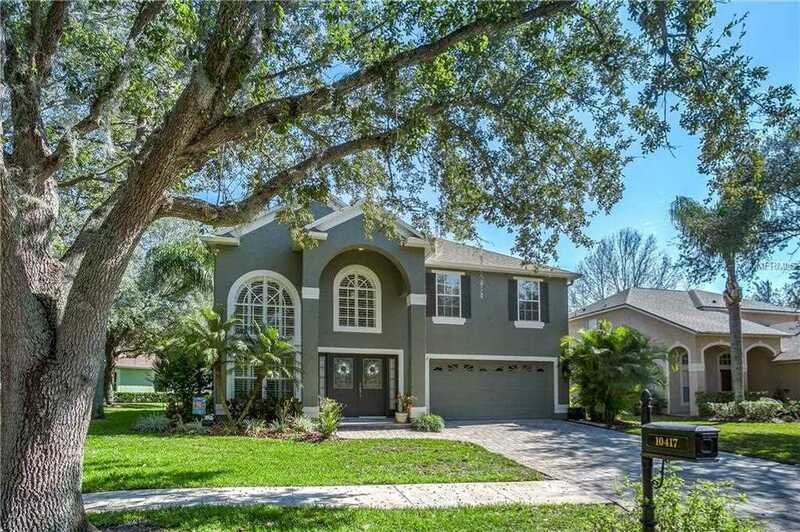 You are viewing the MLS property details of the home for sale at 10417 Lightner Bridge Drive Tampa, FL 33626, which includes 3 bedrooms, 3 bathrooms and has approximately 2072 sq.ft. of living area.